300,000 accesses ! | Machine Intelligence ? 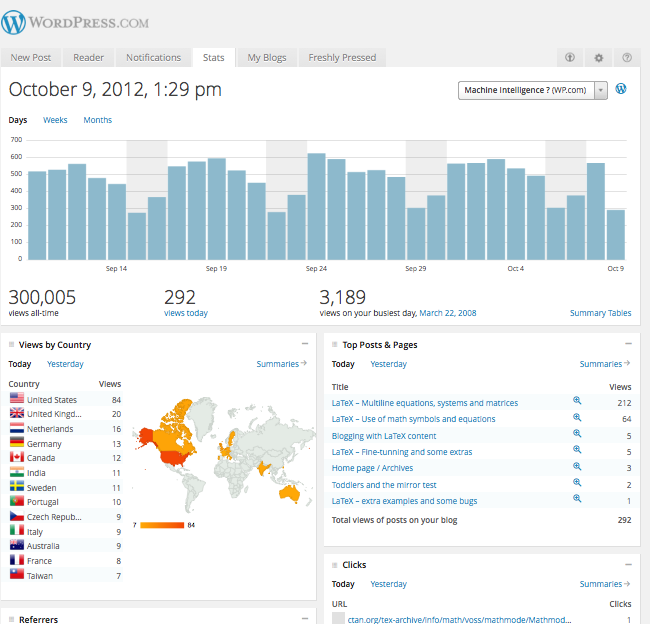 This blog crossed the 300,000 accesses line since the beginning. I have not posted anything for four years and now I am planning to come back with new posts in the field of Cognition and related matters. My last post was on June, 27, 2008, and was about the theme ” Toddlers and the mirror test “. Since then, I have learned a bit more about this field and I feel now more comfortable in discussing the subject. I hope to engage in a good debate, from now. So, thanks to everybody for the interest in my blog, and see you soon ! It’s worth noting that your blog comes as the first result in Google when searching for “multiline equations latex”, and one of the first when looking for “equations latex”!